Our northern style traditional Thai massage course is an intensive beginner course for people who want to perfect their skills. During this complete basic training more than 160 techniques are transmitted. We teach all four positions: supine, side-lying, prone and sitting position, as well as acupressure points, stretching and energy lines. We guide you through a picture book, including space for taking notes, which features positions of the practitioner and client. Group lesson starts every Monday (6 students maximum during this course). Our advanced traditional Thai massage courses focus on strong, deep and creative body work. These techniques are more effective than the ones learned in beginner lesson. During these two courses about 300 different advanced techniques are transmitted through the four traditional positions: supine, side-lying, prone and sitting position. The 1st level focuses on techniques using thumbs, palms and elbows as tools. The 2nd course is based on techniques using knees and feet as tools casino online games. A complete basic traditional Thai massage training, from any style and any school, is required in order to participate in these courses. Moreover, the level 1 is required in order to take the 2nd level. This advanced traditional Thai massage course focuses on using fingers and thumbs as tools in order to enable stronger body work. We teach how to work deeply on receiver’s hands and arms with therapeutic techniques. A complete basic traditional Thai massage training, from any style and any school, is required in order to take this course. This course requires a reservation – minimum one week in advance. It is one of the most interesting Traditional Thai Massage procedures. 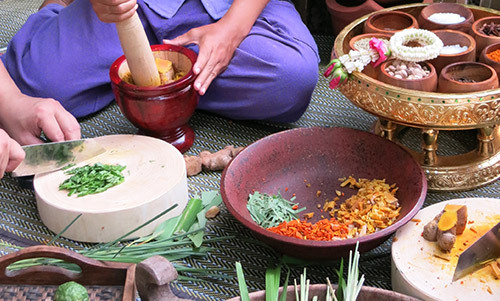 We teach you how to prepare ground fresh herbs and make small herbal ball. This ball is warmed by hot steam. After Thai Massage, we roll the warm ball on the massage area. Thai hot herbs will stimulate a better circulation of blood. Herbal Massage is good for relieving muscle inflammation, pain, bruising, tiredness and cramp. It also prevents patients who cannot move or exercise due to hemiplegia or paralysis from a muscular atrophy. Textbook and certificate are not included in this one day lesson.